Middle School students at Springer School and Center had the opportunity to work with Cincinnati Poet Laureate Pauletta Hansel. She conducted a poetry workshop with each class, beginning by asking how many poets were in the room. Typically, no one raised a hand. At the end of the class, every student responded positively to the same question, because Hansel had led them through the process of writing a poem which involved their experience and their senses. Named Cincinnati Poet Laureate in April, 2016, Hansel is the first to carry that title. Cincinnati once had an official poet, and the position was re-established in 2015 with the title Poet Laureate. Hansel, who will serve for two years, is tasked with promoting the reading and writing of poetry in Cincinnati, and with writing poetry for specific events and occasions. Holding a Master’s degree in Education from Xavier University and a Master’s of Fine Arts in Creative Writing from Queens University in Charlotte, N.C., Hansel has published five volumes of poetry, and her poetry has been published in several journals and anthologies. She is managing editor of Pine Mountain Sand & Gravel, the literary publication of the Southern Appalachian Writers Cooperative. 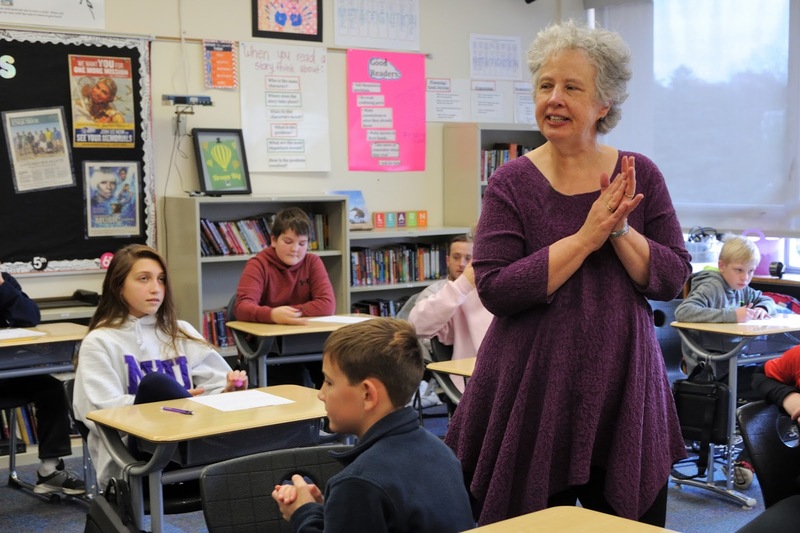 Poet Laureate Pauletta Hansel applauds a Springer student’s newly-written poem. Doing odd jobs for families, neighbors and friends, Middle School students at Springer School and Center raised enough money to send four U.S. veterans to Washington D.C. through Honor Flight Tri-State. The fundraising project was part of preparations students are making for a trip to our nation’s capital in April, which included researching the memorials and monuments visited on the four-day trip. 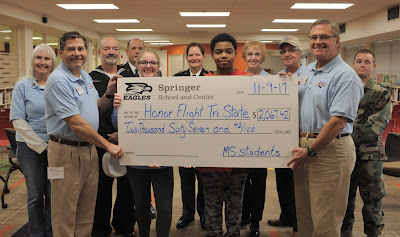 During a recent assembly at the school, students presented Honor Flight Tri-State representatives Tim Cassady and John Mock with a check for $2,067. Four veterans attended the program, as well as several members of the local Honor Flight organization. The veterans, Aviation Machinist Mate 3rd Class, U.S. Navy, Kim Brockhoff, and Private First Class Suzanne Naro, Sergeant Douglas Gresham, and Corporal Luke Lawson of the Ohio Military Reserve, shared with students their experiences in the military and answered questions. Using photos from past Honor Flights, Cassady and Mock described a typical flight – the memorials visited and the honor and appreciation bestowed on the veterans. Headquartered in Cincinnati, Honor Flight Tri-State has made five flights to Washington in 2017, and one “Flightless Honor Flight,” in which vets who are unable to travel are honored locally. Honor Flight Tri-State offers flights to veterans of World War II, Korea and Vietnam who are at least 65 years old. A typical flight honors 72 veterans, each traveling with a personal Guardian. In April, Springer 7th and 8th graders will tour Washington through the Oliver Gale Washington Academy, founded in 2008 by William and Margaret Gale to honor his father. Every other year, the Academy sends around 60 Springer students to Washington, recognizing both Oliver Gale’s support of Springer and his service to our government there during the Eisenhower Administration. Honor Flight Tri-State member Tim Cassady and his wife Kathy have a special connection with Springer. “I’m pleased to be back at Springer, where my late sister Barbara Cassady Frey established Springer’s library in the mid 1980s,” said Tim, “and I’m proud of the United States of America and of our Honor Flight program.” The Cassadys’ son and two nephews are Springer alumni, and Springer’s original library was renovated in 1997 in memory of Barbara Cassady Frey. Springer Student Council Officers Tillie Kraus (Mt. Lookout) and Khai Brock present a check for $2,067 to Honor Flight Ambassadors John Mock and Tim Cassady. They are flanked by Honor Flight Ambassadors Betty Brockhoff, and Kathleen and Mickey Hoffman, and veterans Kim Brockhoff, Douglas Gresham, Suzanne Naro and Luke Lawson.